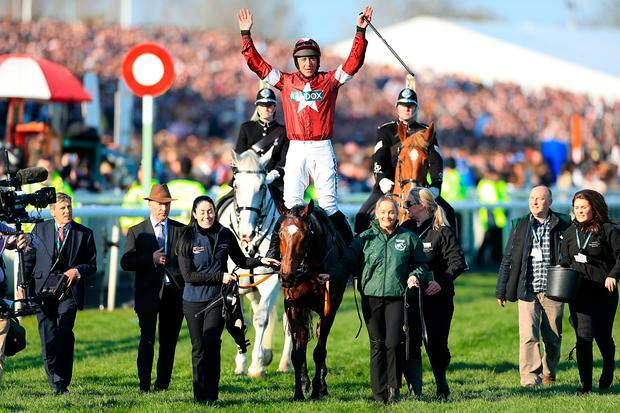 The 172nd Grand National will go down in Aintree folklore as the one when Tiger Roll, racing's rock star, was admitted to one of the most exclusive clubs in sport: a two-time winner of the world's greatest race. Abd-El-Kader, The Colonel, The Lamb and Manifesto won twice in the 19th century when there were traditionally smaller fields but apart from Red Rum, only Reynoldstown, in 1935 and '36, has joined that club in the last 100 years and Tiger Roll could now come back in 12 months' time to try something even Red Rum could not manage: three in a row. Of course the National may be a bit shorter now and the fences a bit more forgiving but that, in a way, is counter-balanced by the fact it is a generally a deeper, better race and, if anything, harder to win. It had not looked promising when the Gordon Elliott-trained nine-year-old initially refused to line up with his 39 rivals but, with a lead from another runner in the Gigginstown colours, he rejoined them and from there on the further they went the better he went for Davy Russell. Though Gordon Elliott had saddled 10 others besides Tiger Roll, it was Willie Mullins who appeared to have the strongest hand as they cleared Becher's second time as Pleasant Company, Rathvinden and Livelovelaugh, three of his four, shared the lead with Jessica Harrington's mare Magic Of Light and Walk In The Mill. But Russell, who had been tucked in behind the leaders for most of the race, began closing in on them as they headed for home and, though he was low over the fourth and third last, Tiger Roll joined the mare at the second last with Russell almost motionless while Paddy Kennedy, having the ride of a lifetime, was all hands to the pump on Magic Of Light. She, however, made a mistake at the last and Russell was taken to the lead by Tiger Roll. "I can't believe it," said Russell, who was once famously sacked as stable jockey by Michael O'Leary over a cup of tea. "At my age now (39), to win two Nationals - it's madness. He's one hell of a horse. The O'Learys have been so good to me throughout my career and Gordon? What can I say?" "He's unbelievable," said owner Michael O'Leary. "There was so little pressure this year. I thought he had no chance of winning a second under that weight but, if anything, he won it easier than he did last year. Davy gave him a masterful ride. I don't think winning a Grand National is ever easy but if it ever was, this was. "The improvement Gordon has brought out of him is amazing. To think we couldn't win a novice chase with him!" Elliott, who has now won three Nationals, the first with Silver Birch and two with Tiger Roll, dedicated the victory to his uncle Willie Elliott who passed away three months ago. "Without him I wouldn't have been in racing," he said. The game 66/1 runner-up, bidding to become the first mare to win the race since 1951, put up a lifetime-best effort. Ironically, Harrington had planned to keep her at home for the Irish National until she took her to The Curragh to give her other intended runner, Sandymount Duke, a lead over the practice National fences. "She jumped them so well at The Curragh I said we'd run her here but Robbie Power (who rode the 19th-fence faller Jury Duty) said, 'They're bigger at Aintree, she won't jump round!' Nicky Henderson has just told me the good news that he was second with his first National runner and he's still waiting to win it 40 years later, so I might have to keep trying now until I'm 110." Rathvinden and Ruby Walsh threatened for a long way but a couple of mistakes, at the water and Valentines, probably cost him though he ran all the way to the line to finish two-and-a-quarter lengths back in third. Walk In The Mill was fourth with the Gold Cup runner-up Anibale Fly, unable to improve on last year, back in fifth. Four of the first five home were Irish-trained horses. In all, 19 finished with Don Poli tail-end Charlie. There were five fallers, one brought down and an unseated rider while the remainder pulled up. Up For Review brought the run of fatality-free Grand Nationals, which stretched back to 2012, to an end when he sustained an injury at the first.